SoCal Supercar meet... by the Beach! Thread: SoCal Supercar meet... by the Beach! 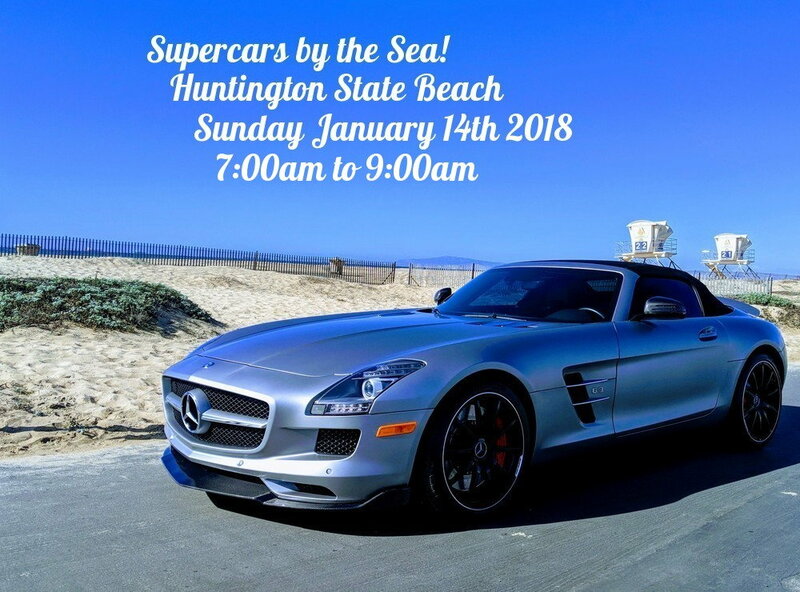 This will be a re-occurring monthly gathering of Supercar Enthusiasts at Huntington State Beach. The first meet will be on Sunday January 14th from 7 a.m. to 9 a.m. This event is fully approved & permitted by the California Department of Parks and Recreation. I developed this event with the willingness of the State to allow growth in its 1,000+ space parking lot. As car meets continue to get pushed out of existing venues, I was seeking a permanent solution for all to enjoy for decades to come. The best way to enjoy the event is to purchase the Annual State Parks Pass or there is a $15 day use pass to get into the park. Parking will be reserved for each meet (Plenty of room for trucks and trailers). Enter at Magnolia & PCH. The Park prefers cash but, does have credit card capability at entry. A special thank you to Roger at D’elegance Detailing as the first sponsor on board. Plus, AMG SoCal Lounge for sponsoring entry for the mobile catering. Required is a one-time free registration. We can’t have any “anonymous” attendees. Re: SoCal Supercar meet... by the Beach! So is this a modern supercar only kinda thing, or are all cars welcome? Senior Global Product & Training Specialist | Meguiar's Inc. Remember, this hobby is supposed to be your therapy, not the reason you need therapy. Just a name, just a name. All welcome. Extra thanks to Java On The Go for coming out to provide the coffee and food. This month many Car Clubs are setting their calendars for 2018. If you have not yet done this, make sure to follow up. I'm sure there's a reason, but why just 2 hours and so early? Typically C&C type events have been from 7am to 9am and able to draw 400+ cars a week like the old Irvine one. It moved to San Clemente and had to go form 7-9 to 9-11 because of neighborhood complaints (It will eventually have to go because of this). Supercars by the Sea has no neighbor's. 7 am is great because you can get out and drive the car a bit before traffic and get home to family at a reasonable time. At the Supercars by the Sea meet you can arrive 6:30am and stay as long as you want. You are buying a day pass or annual pass. Its advertised as 7-9 as the State will currently cone/secure off our parking for that time frame. As we grow to more then 150, it will become a 3 hour (7am-10am) meet. All cars are welcome... remember 40-50 year old models are still Super! Just register once and you are good. All times are GMT -8. The time now is 10:21 AM.